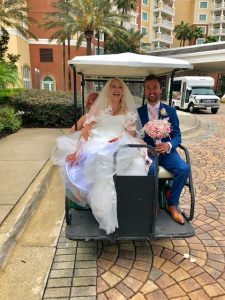 Bridie and Henry traveled from England to exchange wedding vows at the beautiful Reunion Resort in a destination wedding ceremony . Lisa New with Reunion Resort made sure every detail for their stay was accounted for. Taylor with Blush by Brandee Gaar was the coordinator for the couple. When rain threatened to ruin their ceremony plans the couple opted for a dry, air conditioned ballroom inside the resort. With all the florals from The Flower Lady in Kissimmee, Florida moved inside, the ballroom looked more like an English Garden, filled with garden roses and peonies than a ballroom. Pro Style Entertainment acted as the videographer, photographer, and DJ for the couple and their guests during the reception, while Lisa Ferrigno played the violin during the ceremony and cocktail hour. Cut the Cake created the deliciously beautiful cake for the lovely couple. Caring – always making sure I am ok and asking if i need anything Loving – always tells me he loves me We have been together 6 and a half years and everyday our love grows stronger, we are the type of couple who love each other’s company we are rarely apart. I want to do everything with henry, I hate doing things alone , we are a couple that live out of each others pocket but never get tired of it . The more time we spend together the better we are . Henry though a groom of few words said: She’s loving and caring Very kind Forever makes me laugh day in day out Absolutely gorgeous Always wants to be with me Always wants the best for me Will do anything for me Will go out her way to make me happy / but me surprise gifts Just an amazing woman in every single way!